you get tired of certain “friends” only calling you when they need something. Is this something you deal with? I know I have dealt with it off and on for years. And I’ve heard many others complain of this particular issue as well. When things are great, you don’t hear a thing from certain folks, but boy oh boy… let them have a need that you’re able to fill and they’re ringing your phone off the hook. Often times, people like that also don’t have time for you when you need them. Ever notice that? You have a crisis and could use some of their help and it’s like looking for a needle in a haystack, cause now they’re sure impossible to find. It can be really frustrating to say the least. Occasionally, you might even be tempted to simply quit being their friend at all, but something always stops you from going that far. The next time they call with a need, you can’t help but go ahead and fill that need if at all possible. Now that you’re sitting there thinking about how “Yeah! It really IS annoying when So n So does that to me!”, imagine if you were GOD……..
God has to deal with this ALL THE TIME. Literally… ALL THE TIME. It never ends for Him. There’s never a break from being taken for granted this way. Can you possibly begin to imagine? As I sat thinking about this I felt so sad and so sorry. Sorry because I’ve done that to God myself in the past. 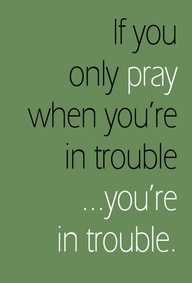 I’ve been that person who only prayed and spoke to the Lord when I needed something or was in some type of trouble. I’m thankful that this is no longer “me” and I pray that it’s never ever “me” again. I know how horrible being treated that way makes me feel and I would never want to treat my very Creator, my Father, my Lord and Savior so badly. Folks, this is sin in one of it’s worst forms. If this is something you do, then please realize it, ask for forgiveness and make a definite point to no longer take your very Creator Himself for granted this way again. Spend quality time with the Lord your God. He loves you dearly and wants to be more than your trouble fixer, habit at the dinner table, or your obligation on Sundays. He gives Himself freely to us and we should do exactly the same.